Wilson Cruz was born today, December 27, in 1973. He is an American actor known for playing Rickie Vasquez on My So-Called Life, Angel in the Broadway production of Rent, the recurring character Junito on Noah's Arc, and most recently, one of the first out characters on the new Star Trek: Discovery. As an openly gay man of Puerto Rican ancestry, he has served as an advocate for gay youth, especially gay youth of color. 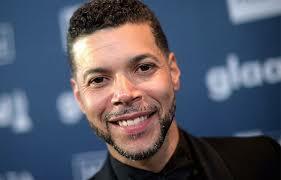 Wilson Cruz was born in Brooklyn, New York, to parents of Puerto Rican descent. His family eventually moved to Rialto, California. At age 19, Cruz came out to his parents as gay, first to his mother and then his father. While his mother was initially hurt and shocked, she eventually accepted the news. His father, however, threw him out of the house, and Cruz spent the next few months living in his car and at the homes of friends. He later reconciled with his father. Cruz went to Hollywood to seek work as an actor, intending to be open about his sexuality from the beginning of his career. In 1994 he was cast as Enrique "Rickie" Vasquez, a troubled gay teen, in the short-lived critically acclaimed cult classic TV series My So-Called Life. This made Cruz the first openly gay actor to play an openly gay character in a leading role in a television series. Following My So-Called Life's cancellation, Cruz went on to play J. Edgar Hoover's servant Joaquin in Oliver Stone's film Nixon. In 1996, he appeared with David Arquette as Mikey in Johns, about the day-to-day struggles of male prostitutes. In 1998, he portrayed Angel in the Broadway production of Rent and in 2000 played Victor in the final season of Party of Five. He also had a recurring role as Rafael de la Cruz on the series, Raising the Bar. Cruz works with and advocates on behalf of LGBT youth, especially youth of color. He has volunteered his time as host for the Youth Zone, an online community at Gay.com for LGBT youth. He was the Grand Marshal of the 1998 West Hollywood Gay Pride parade and the 2005 Chicago Pride Parade. In 2008, he was the keynote speaker at the University of Illinois at Chicago's Lavender Graduation and Rainbow Banquet honoring graduating LGBT students. Cruz joined the board of directors of GLAAD in 1997 in order to assist the organization through a leadership transition, and joined the staff of GLAAD in 2012 as a National Spokesperson and Strategic Giving Officer. Anthony Rapp and Wilson Cruz said it was "surreal" when they were invited to join the cast of "Star Trek: Discovery" on CBS All Access. The co-stars told CBSN that they were always fans of the franchise. "I've always been enamored with the series," [Cruz] said. "I did see myself as a part of this. I wanted to be a part of Broadway and I wanted to be a part of Star Trek." Rapp and Cruz's characters, who share a romance, will be the "Star Trek" series' first gay characters. Cruz said it also thickens the plot as the characters learn to navigate their jobs along with their romance. "It's about how I balance my responsibilities as the ship's doctor and how I balance my responsibilities to the person I love," he said.